One of the North-East’s greatest eccentrics, William Emerson, was born in Hurworth-on-Tees in 1701. He was also a brilliant mathematician, and can perhaps rightly be called a savant – a genius in his chosen field, yet a social misfit extraordinaire. His writings reached far and wide, including into the substantial mind and intellect of the great Thomas Jefferson. He followed his schoolmaster father, Dudley, into the sphere of mathematics. As a young student, though, his offensive manner caused him to be sent to Newcastle and York during the course of his studies. In 1730 he returned to Hurworth to take over the running of his late father’s school, but his social shortcomings led to the institution’s closure in 1733. He resolved instead to live off his inherited estate near Eastgate, Weardale. In 1735 he managed to get himself married to Elizabeth Johnson, the daughter of the Hurworth rector. However, his father-in-law, disapproving of his unkempt and uncouth new relative, refused to pay the £500 dowry, so Emerson piled all his wife’s clothes into a barrow and wheeled it round to the parsonage, saying he refused “to be beholden to such a fellow for a single rag”. In time, though, Emerson would make all those who thought him a wastrel eat their words. This outspokenness marked Emerson’s character all his life. He was often vulgar, ungrateful, bad-tempered, and had an infamously scruffy dress code. He would only tie the top and bottom buttons of his waistcoat, and wear his shirt back-to-front to keep himself warm. Then there were his bulging shin-covers, worn to stop his legs burning in front of the fire – to say nothing of his ill-fitting wigs! He walked everywhere, drank to excess and would stand fishing in the Tees for hours in the hope that the water would wash out his gout. Of its many parks and nature reserves (26 at the last count), Darlington’s most famous open space is that which is known as South Park, near the A167 in the nether regions of the town. In addition to its fond place in the hearts of locals it also lays claim to being the very first officially designated public park in the North-East. South Park’s known history begins in the mid-seventeenth century when it was mentioned in the will of Sir James Belasses dated 1636. In this document Sir James (a resident of Hartlepool, strangely) bequeathed a 10 hectare site known as Poor Howdens Farm to the town for charitable purposes. Essentially, this meant renting out a few fields in the vicinity to local farmers and the income handed out to the local poor. Nothing much else seems to have been done with the open expanse until, more than two centuries later, the Victorian trustees of the charity recommended that the greater part of the site ‘be used as a park or promenade and a recreation ground for the public at large’. And so it was that during 1850-53 work was carried out to turn the vision into, at last, a proper reality. With a good deal of financial help from the Pease and Backhouse families, it was known originally as Belasses Park, then the People’s Park. Eventually, it came to be called South Park, and currently extends to some 26 hectares (91 acres). It has always been a popular recreational venue and, after recent Heritage Lottery funding, is more attractive than ever – playing host to regular concerts and other events. It boasts a lake, bandstand, skateboard park, games area, education centre, café, and rock, rose and sensory gardens. There is also, of course, the famous aviary – once the home of Max the foul-mouthed parrot! It is a magnificent example of the very best type of Victorian municipal park, and is Grade II registered and holder of a Green Flag Award since 2006. 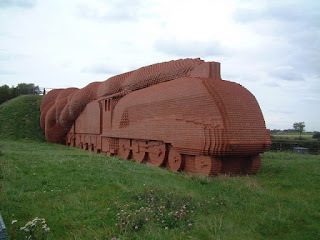 For a sculpture with a difference, you can do little better than the splendid full-size brick effort at the side of the A66 to the east of Darlington. It is called simply ‘Train’, and was built to the designs of David Mach in 1997. It was, of course, commissioned in celebration of the town’s rich railway heritage, and represents a Mallard-type locomotive travelling at full pelt, with steam billowing from its funnel. It appears also to be emerging from the hillside as if leaving a tunnel. The landmark can be viewed from any angle – including above, thanks to a specially-built platform, from where you can cast your eyes over its 185,000 bricks. It is 23ft high and 130ft long, and took a team of 34 men five months to build. It was funded from several sources, including the National Lottery and Morrisons supermarket, and was unveiled by Lord Palumbo of Walbrook. In case you don’t really like it and are wondering, well, it cost around £760,000. But it does contain time capsules from local schoolchildren and, curiously, special ‘bat bricks’ to encourage wildlife to make use of its hollow interior. Quakers have played a very important role in the history of Darlington and its environs – and at a time when they were barred from political life, universities, the judiciary and a whole host of other roles in society. Being forced into their own businesses, they often found themselves acting as our bankers, financiers and industrialists – with startling results. One such tale is the rise of the mighty Barclays Bank, which can trace a substantial portion of its roots to the town of Darlington. James Backhouse, a wealthy Quaker flax dresser and linen manufacturer, set up Backhouse’s Bank in the town in 1774 – originally as a sideline to his main business (from the 1750s), then subsequently as an entity in its own right. As the Industrial Revolution took hold in the years following this bold move, the institution grew, too – essentially bankrolling the growth of the railways and related industries of the area (most notably financing the Stockton & Darlington Railway). James’s sons, Jonathan and James Jnr, helped and then succeeded their father; and in turn Jonathan’s son (another Jonathan) took over. The next generation (Edmund) took things even further; to be followed by his son, Sir Jonathan Backhouse – under whose guidance the bank merged with Gurney’s Bank of Norwich and the existing Barclays of London in 1896 to form the nationwide monster that we now know as Barclays Bank. At the time of the merger of these institutions – all of them Quaker-run – there were 20 Backhouse branches across the region, and this northern powerhouse was one of the lead banks in the amalgamation. Interestingly, the Backhouse and Barclay families even intermarried. 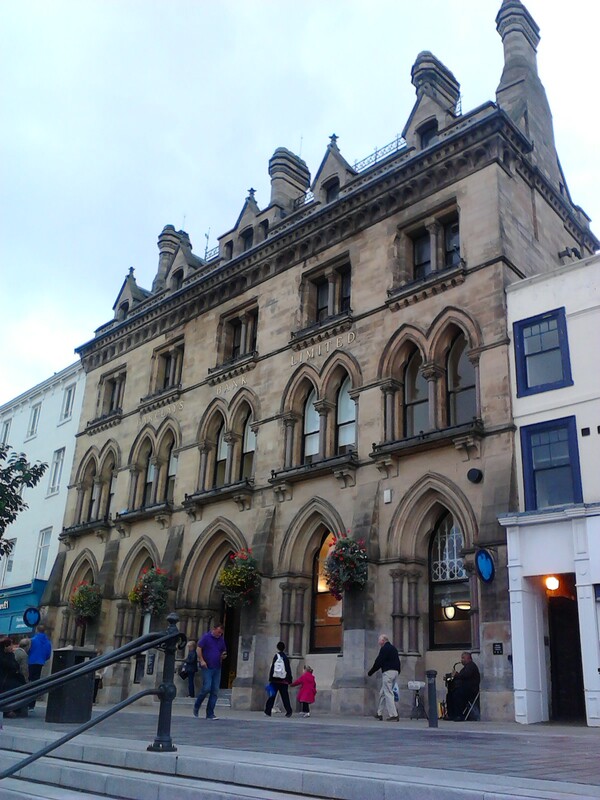 Alfred Backhouse, who for a time ran the HQ of the Backhouse empire from what is now the Barclays Bank building in High Row, Darlington, married Rachel Barclay in 1851. The couple, who were extremely wealthy, were pioneers of public health, helping to establish two hospitals in the town. Similarly, Alfred’s nephew, James Edward, also married into the Barclay family. Many of the above named individuals are buried in the Quaker (Friends) Burial Ground in the town.